Interview: Jorja Smith on her debut album 'Lost & Found', playing Laneway Festival 2019, and creative inspirations. A papier-mâché dog sits in the corner of Jorja Smith’s London apartment - a gift from her mum, Jolene (who also makes jewellery which Smith is often seen wearing). She doesn’t make it back home to Walsall (an industrial town outside of Birmingham) too often these days with her busy touring and studio schedule, so the memento of her dog will have to do. Smith tells me excitedly though that she plans on getting a dog of her own soon, as she sits cross-legged on her living room floor, eating a late-lunch after spending her day in the studio. With an effortlessly powerful voice, the 21-year-old Smith (who was just 20 when her debut album ‘Lost & Found’ dropped earlier this year) has been captivating listeners globally, with heartfelt lyricism that has earned her accolades from the Brits (she won the Critic’ Choice Award), the BBC (#4 on the BBC Sound Of 2017), and collaborations with the likes of Kali Uchis, Stormzy, and Drake. ...it’s important with your lyrics, when the person presses play and then you say something, and they realise they’re not alone - you’re going through the same things. COUP DE MAIN: You’re coming to New Zealand and Australia for the first time ever to play Laneway Festival next January/February! Are you excited to come over for these shows? JORJA SMITH: I am excited, because I’ve never been. I don’t know what to expect! CDM: The flight is very long, just warning you in advance. JORJA: I went to Japan recently. I’m getting quite good at flying, just because I’ve been flying a lot, so I’m used to long flights. I don’t know about a double 12 hour flight though. CDM: Billie Eilish is also playing Laneway! JORJA: She’s really cool. I’ve never met her though. CDM: Do you have a favourite Billie song? JORJA: I like her Colors performance! ‘Watch’ is my favourite song. That is beautiful, you wouldn’t expect her to sound how she does. CDM: You talked with Complex about your songwriting process saying, "I used to write stories but I’d never finish them. I wrote poems...” Is story-writing something you still do? Does it become songwriting? CDM: So it starts with a base of truth? JORJA: Yeah sometimes. Or I exaggerate. I don’t really write stories, but I have written before when I have made up things, to talk about a certain scenario. CDM: Have you been writing much since releasing ‘Lost & Found’? JORJA: No, because I’ve been doing loads of shows. When I can, I try. I have got some sessions coming up, which I’m excited to just write in. I like writing with a band. When I’m on tour, we try in soundcheck. My UK, European, and US tour, it’s basically gonna be the same set - after two or three shows of soundchecking, when we soundcheck we’ll probably just jam, and hopefully write some stuff. But it’s hard on tour, because you’re in ‘tour/performing’ mode, and can’t think outside of singing on-stage. CDM: The lyrics in ‘Teenage Fantasy’ are so relatable, “I need to grow and find myself before I let somebody love me / Because at the moment I don’t know me.” Why do you think it’s important to know who you are as a person and love yourself as a person before letting somebody else in? JORJA: I mean, I don’t even follow my own advice. <laughs> I think it’s definitely important to know yourself - but I feel like we’re constantly finding out about ourselves and we’re constantly growing. I’m not old enough to say if I will know myself, but I feel like we are constantly learning about ourselves. So I feel maybe just be more sure of yourself before you want someone else to know you, if you don’t know you. Some people know you better than you know yourself, which is really crazy. CDM: In your album’s title-track ‘Lost & Found’ you sing, "I’m in love with the thought of you," which is a really interesting sentiment because quite often people love with rose-coloured glasses or place their partner on a pedestal. Is it easier to be in love with the thought of someone, rather than reality, which is often more complicated? JORJA: I wrote that song when I was sixteen, because this boy didn’t like me! I was obsessed with him. Yeah, I think so, because you can make things up in your head. You can make it out to be amazing, and then when it comes to it, even just your first impressions of what someone is going to be before you meet them or before you go on a date, you might be like, ‘They’re going to be amazing!’ and then you meet them and they’re just boring. CDM: It’s the reality versus fantasy playing out. JORJA: Exactly. That’s why you’ve got to find the right person, or you’ll just keep doing that and keep making things up in your head, and then you’re at home with someone who’s boring. CDM: Similarly, in 'Teenage Fantasy' you explore similar themes of not being on the same page as your partner, and wanting what you can't have. Has pop-culture conditioned us to long for a 'dramatic' love and wanting "someone, who we think is the one, just to fit in" as you say in that song? JORJA: I think you used to at school. Everyone seemed to want a boyfriend, and no boys liked me. That’s why I wrote that song, because this boy I liked, he didn’t like me. He was a bit naughty, and all my friends were like, ‘You can’t like him, he’s naughty,’ and he didn’t even like me anyway. I think anything, films and TV, make you want a fairytale, but you just have to think realistically. CDM: The themes of 'being lost' and 'being found' are woven all throughout your album, especially in 'February 3rd', 'Lifeboats (Freestyle)' and on 'Tomorrow'. Is losing and finding yourself something that you've just got to do to evolve yourself as a person? JORJA: I think I’m always doing it. I think that’s where I’m at. Today, I’m found. CDM: Are you aware of it, or do you look back retrospectively? JORJA: I’m definitely aware of everything that I do, I’m always questioning myself and over-thinking. But then I just kind of go with the flow with everything. CDM: Did you go into making the album knowing those themes were gonna play such a big part in your album? JORJA: No, the songs on the album were written before I decided I wanted to make an album. So last year I said to my manager, ‘I want an album,’ and he was like, ‘Okay, here’s a list of all the songs you wrote, choose what you want on there.’ There wasn’t a concept, I didn’t write the songs with a concept, I just wrote these songs. Then when I put them together, I felt like they painted a picture of my journey from sixteen to early adult life. CDM: That’s so interesting! So often people know they have to do an album and write the songs with that in mind. JORJA: The thing is, now I’m writing new songs, so I don’t want to be writing specifically for an album, I just want to write because I’ve got stuff to write about. CDM: It’s awesome that you released ‘Beautiful Little Fools’ on International Woman’s Day, and it’s such a strong empowering song. Why did you find female perceptions and expectations of beauty a theme that you wanted to explore in that song? JORJA: I studied English Literature at school and I read ‘The Great Gatsby’, and that’s what inspired ‘Beautiful Little Fools’. I remember reading the quote, “I hope she'll be a fool - that's the best thing a girl can be in this world, a beautiful little fool." I was sitting there, and that quote just stuck with me. I was also thinking about how there wasn’t a song that I was listening to that made me feel good about myself, so I just wrote that. CDM: And now it makes you feel good! JORJA: Yes, and other little girls too. And not just other little girls, I know I’m saying that’s what girls are destined for, but people can listen to things and it can mean something to them. CDM: Do you often find yourself inspired by things you read or films/TV that you watch? JORJA: Yeah, anything inspires me. I could be walking down the road and see some people, and I’ll think of something. I do enjoy watching films too. CDM: Is there anything you’ve been watching recently? JORJA: No, I haven’t been watching any TV lately. What was the last thing I watched? I was watching some documentary on Netflix called ‘Afflicted’, and it’s about these new chronic illnesses. One woman is allergic to WiFi, her husband doesn’t believe her… She moves to this random place where people don’t have WiFi. It’s not inspiring me, but it’s interesting. It is quite good though! There’s one guy who hasn’t left his bed for two years, because any movement is too much for him. CDM: In ‘Lifeboats’ (Freestyle)' you say, "If I saw somebody drowning in a sea of self-confusion / I wanna be the one to try and understand why their tide ain't coming in." Is there a societal tendency to look the other way when you see someone struggling? JORJA: Yeah. Also, I feel like a lot of people have the mentality of, ‘Oh, someone else can help them.’ And if everyone thinks like that, then nobody’s going to help anybody. But yeah, I feel like a lot of people are like, ‘If I didn’t see it, it didn’t happen.’ But it is happening, right in front of you. CDM: The lyrics of 'Lifeboats’ (Freestyle)' also remind me a lot of a play I watched last week in London called 'The Jungle', which is about the refugee crisis in Calais and really super heartbreaking. Your lyric, "We're too selfish in the lifeboats," really rings true about how I felt after watching the play - you feel really helpless, like you ought to be doing more to help others but you don’t know what to do. Do you think the herd mentality of, 'What can one person do to help? Someone else will do it instead,' is dangerous because then everyone just passes the 'lifeboat guilt' on? JORJA: It is, but I feel like that with everything. People only do stuff when they see someone else doing it. CDM: It’s a psychological thing, that if you see someone doing something you’re more likely to do so. JORJA: People like to latch onto stuff, and they don’t even know what they’re really getting themselves into. I feel like a lot of people like following what people are doing, but they don’t have enough information on why they even are doing it. I feel like people should have two views of what they’re doing, a view for and a view against. Certain movements are only for something, but they don’t know the other view. I’m reading a book at the moment called ‘The Will To Change’ by bell hooks and it’s about the male patriarchal society. It looks at how from a young boy you’re told, ‘Don’t cry,’ it’s interesting reading a different point of view. CDM: ’Don't Watch Me Cry' is heartbreaking. I'm so, so sorry you went through that. JORJA: I didn’t, I actually exaggerated, but I was really sad. Basically, it is true, everything I say in the song, but I wasn’t going out with anyone, but I just really liked this boy, and then he left and went to LA and I never saw him again. I was so sad, and I wrote this song and I felt so much better. It sounds like a really heartbreaking relationship, he told me not to wait for him, and I did for no reason. CDM: Was that therapeutic for you to put your emotions into song-form? CDM: And now you can sing them for everyone. JORJA: And everyone can sing with me too! That’s why I like writing, because it helps other people. If you’re going through the same things… That’s why I think it’s important with your lyrics, when the person presses play and then you say something, and they realise they’re not alone - you’re going through the same things. 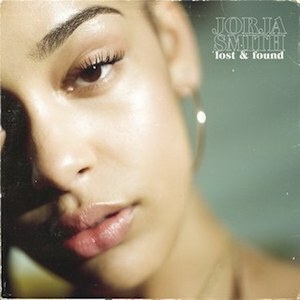 Jorja Smith’s album ‘Lost & Found’ is out now - click here to purchase.